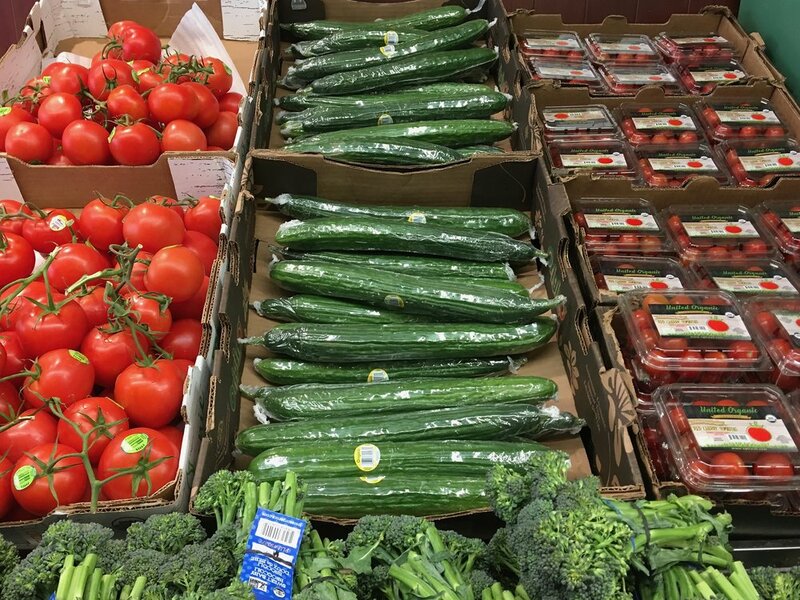 Normally at the market there are 3 main types of cucumbers: the "regular" slice 'em up for a salad cucumber, the "I look like I should be a pickle" cucumber, and the "expensive and wrapped in plastic" cucumber. A few days ago, the "expensive and wrapped in plastic" cucumbers were on sale at my market, so I bought a few. I really do love the taste more than the regular cucumbers, which most of the time are bitter and tough. But they are so expensive, usually more than twice the price of a regular cucumber! What makes these plastic-wrapped beauties so unique anyways?!? Apparently these cucumbers have a more formal name, English cucumbers. Sometimes also known as seedless cucumbers, or burpless cucumbers, or hot house cucumbers. They're longer and skinnier than 'regular' slicing cucumbers. They have a thinner skin and smaller seeds, which gives them a sweeter and less bitter flavor. Because of the thinner skin, they are often sold wrapped in plastic. The plastic protects them from damage and helps them last longer. Essentially, the plastic prevents moisture from leaving the cucumber, so they don't turned in to a dried-up raisin of a cuke. When you have these cucumbers at home, don't remove the plastic. Only unwrap what you plan to use, and then wrap the rest back up in it's plastic home. This will help it to stay fresher longer. Regular 'slicing' cucumbers, unlike their plastic-wrapped friends, are typically coated with an edible wax to help protect them from damage and so they last longer. English cucumbers are typically grown to be more uniform in shape and size, which would make them easier to wrap. Regular slicing cucumber have more variance in shape, which would make them harder to wrap and therefore easier to wax. Wrapping in plastic differentiates the English cucumber from it's "competitors". Brand recognition! The plastic makes them look more "special" maybe? Or more precious because they are nestled in that plastic sleeping bag? And it helps you, the customer, accept a higher price? If you want to try and remove some of the wax from your cucumbers, there are several things to try. Certainly all fruits and veggies should be washed carefully before you eat them (even if you plan to peel them first). There are some websites that say you can use a scrub brush to remove the wax, or soak in a vinegar solution. But, honestly, the easiest (and tastiest!) tip is to buy as much of your produce as you can from the farmer's market, where they are less likely to use wax because the produce is just FRESHER! Cucumbers from the market, even the regular slicing cucumbers, are so delicious and sweet and juicy, you'll just want to eat it whole. What is your favorite way to enjoy cucumbers? Let me know in the comments!